Tune in Saturday to hear about all the yard work Pat got done THIS week! Heh, it really does sound rather boring when you put it that way. This goes along with the commotion I caused in the board game thread though. Increasingly it feels like I'm burning the candle at both ends. Work is work. It will always be there, a minimum of 40 hours a week, with the exception of the rare day off or all too brief vacation. Weekends and evenings really aren't all that enjoyable anymore. From the second I get home there's always something pressing, and not even a moment to relax. It's draining, and it's endlessly frustrating. That software update I mentioned on Friday got delayed to today. 25 minutes until everything falls apart! Hooray! Jay wishes he could do that much yard work. He has to settle for virtual fields. Anyone know anything accurate about Wish? I'm not asking to promote it -- just the opposite, in fact. I want to know if the one purchase I made from it was a good idea. I gave into temptation and bought a flash drive from them. It sounded like a joke because it was a 2TB flash drive -- which is unheard of and possibly physically impossible with current technology. When I got it, it had no maker ID -- but when I checked it, it did in fact show in my This PC display as being 2TB. But that's all I've done with it. Because I am skeptical that it can really be that much. And since it was so alarmingly cheap -- about $20 IIRC -- I'm almost positive that it's counterfeit and that I'd better not try and keep data on it. They also sell Huawei SD cards, which might not be legal in the United States even if they were genuine. I'll admit that generally speaking, I don't mind yardwork - especially compared to my occupation. It is nice to enjoy the results of that work, even if the work itself can be difficult sometimes. I didn't enjoy the work that needed to be done this weekend. A lot of digging and a lot of uncertainty. I was very relieved when everything was finished however. And even if I don't mind yardwork, there is other stuff I would much rather be doing. I'm curious about that as well. What I've heard about them is that 95% of the stuff you can buy via Wish is a cheap knockoff from China. Can't say that I know more than word of mouth, however. I hate dealing with Comcast. In this situation, you may have to insist (on the phone) that you agreed to a specific price, and that they did not accurately update your account. If you need to, tell them to review the call containing the original negotiation. They have records (date/time) of every interaction you've had with them. If you're talking to someone without that level of access, ask to speak to someone who has the authority to review prior calls. I had to do this about a year ago. They agreed to a price, and then overcharged me. They were skeptical that they "would have" agreed to the price when I challenged the error. I told them that I did not care about what they "normally" did or "usually would" do. I cared about what they agreed to when speaking with me about my account. They put me on hold, reviewed the original call, apologized, and refunded the overcharge. It's all a huge waste of time. They are an incompetent pseudo-monopoly whose entire business model is to charge more money to people who don't hassle them. Your payment plan is always lower, and usually much lower, if you can devote at least an hour per year grilling them on the phone. It's draining, but that's how ISPs work in the United States. The goal is never to fix the problem or provide good service. The goal is always to deflect you with layers of unresponsiveness that exist for plausible deniability. Yea, I'm about ready for today to be over with. Actually, I was dreading today, but went much better than I anticipated. Of course, this week's calendar is insane, so check with me on Friday... Good Friday. It's all good. EFT has been hard lately due to 1) a slight rise in hackers, apparently - they showed up after the recent wipe in bigger numbers and sadly there isn't a good reporting tool for them right now. 2) Lots of numbers of people playing the game and that can mean that servers are full of danger. But I'd be up to try some raids later this week (Tue-Fri). Sadly I'm nearly broke now due to too many bad raids but hopefully I can get that changed soon. Sadly I'm nearly broke now due to too many bad raids but hopefully I can get that changed soon. I'll admit that within the context of the game, I have no idea what that means. Haven't played online yet, so I have no idea how the stash works, or even what the mechanics are outside of "shoot the things". I have a feeling you'll have fun taking me to school. Actually, I should really look that up. I'm interested now. I get that there's a "Risk vs. Reward" thing going on in the game, that when you go into a session, you can only keep the loot that you find if you manage to make it to an Extraction point. If you're killed, you lose your stuff. I got that part. And I assume that your "stash" is where you keep stuff between games. And you can choose to bring stuff from your stash into a match, at the risk of losing it if you're killed. At the moment, I don't have much of anything in my stash other than what the game gives you at the start. In the offline games I've played I start with an AKS-74u (I think), and have several pistols in my stash. Does that mean if I start a game with the AK, but get killed that it's gone? That would be tough. Although, it would be kindof cool starting a game with literally nothing, sneaking in, grabbing a bunch of stuff and trying to exfil out just to start building up the stash. Sortof like a Metal Gear thing. I should probably read up on this. I'm obviously clueless here. 2) Lots of numbers of people playing the game and that can mean that servers are full of danger. Also, this is great. I'm about to jump into a game, already late to the party with Tony, who is going to be telling all these cool tricks to survive encounters with kitted out vets, while I'm wandering into the fight with a 9mm pistol and a single clip. 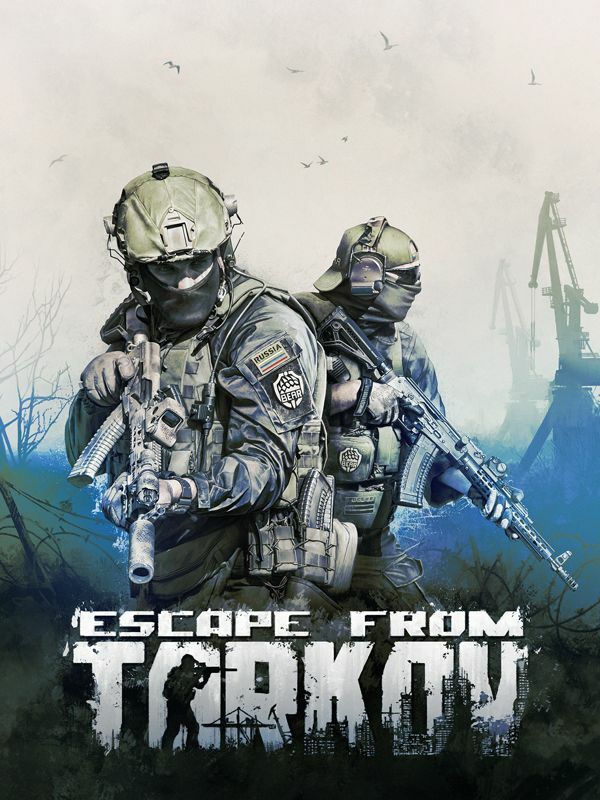 Escape from Tarkov: Get busy living or get busy dying. Escape From Tarkov is the best risk management game out there and quite possibly the deepest shooter of its kind available. It's a fantastic mix of genres blended together in nearly perfect balance. The game's depth in terms of loot and its unforgiving combat make this the most fun you'll have failing in a game. It's an unapologetically deep and complex experience and as long as you have someone mentor you through your initial experiences with the game, you'll probably fall in love with it like I have. If I had to use other games to describe it, I'd say it's like a mixture of PlayerUnknown Battlegrounds, Diablo, and a Survival game like Rust or Seven Days to Die. Yes, shooting is the primary gameplay element, but there are many other interesting aspects that make EFT a compelling and unique gameplay experience. For example, I love that you can do "raids" with a group up to five players or just by yourself and still have fun. It's not an easy game nor a game that's even remotely forgiving to newcomers but once you have a basic familiarity with the game's systems, it's not unfairly difficult - though that also depends on who you run into during a "raid." Some players, of course, are deadly and not to be trifled with while others are easier to kill. Sometimes you'll get lucky and put a bullet in the back of an enemy looting - much like in a Battle Royale - and that excellent timing will net you a kill you wouldn’t otherwise have gotten. Yes, this is a game where if you die before you extract OR don't extract in time before the raid timer ends, you will lose everything you had on your person. In EFT, managing the risks you take (in terms of what loot you'll take with you on a mission, how you approach any given map, and so forth) is nearly a sub-game of its own. Do I take my best gun with me, the one I spent hundreds of Rubles blinging out, so that I have the best possible bad-guy-killing-boomstick? Or do I avoid risking the loss of my expensive and rare gun in favor of wimpier weapons but ones that I can stomach losing if I die? What about that same question with Armor, or my huge “I can fit a small Humvee in here” Backpack that I got on my last raid? Or do I bring my rare medical items that might help me survive what would normally be a deadly encounter, knowing that if I am killed, some other player will own them instead? It's a dangerous balancing act and adding this layer of risk to the gameplay makes everything that much more satisfying when things go right and that much more agonizing when they don’t. When there's nothing to lose, there's also not much to gain. EFT leverages this concept to create tension that players have to constantly manage. However, EFT has also (smartly) hedged their bets a little bit by giving players some measure of control over that difficulty or at least over how much they stand to lose. They do this in three clever ways. The first thing is that players can choose which type of Raid to undertake. There are both SCAV (Scavenger) or PMC (Private Military Contractor) raids. A PMC raid is one where the player kits out his character with all of his own gear and that's all that he'll be bringing into the raid. Anything he finds during the raid (by looting dead bodies or searching bags, lockers, containers, etc...) he can keep but conversely, everything he loses by dying, is permanently lost. That's the primary way the game is expected to be played and the one most preferred by experienced players as it represents the true risk/reward dynamic of EFT. One nice touch is that players can do a PMC run in an offline mode with or without AI enemies, to try out new gun builds or learn a map a bit better or to just practice against bots. The SCAV raid is one of these three ways that Battlestate Games helps players have an easier time of things. It's the other alternative play mode to PMC raids. Players will be randomly kitted out with gear each time they do a SCAV run so that they don't have to risk losing their own great guns or gear. Since players always keep whatever they extract/escape with, this is basically free stuff PLUS whatever loot they can grab or fit into their storage devices while on the raid. This allows players to avoid losing their favorite stuff while they build up their bank accounts from selling items they extra with IF they survive to do so. Another thing that can lighten a player's load is that they can have one of the AI Traders "insure" whatever gear they'd like. What insurance does is give a player a small percentage chance that they'll get any loot they lost on a bad run (translation: they died) back about 12 hours later, in real time. Insurance prices are pretty reasonable for less expensive things, so it can be worth it at lower levels or for less powerful/useful gear. Some maps, however, are so dangerous that the AI trader's minions who go looking for your loot can't get stuff back. And if someone has looted your body and taken those items, then all bets are off, you won't be getting that stuff back. What some players do when in dire straits or badly injured, is to toss their gear in a hiding spot or in thick bushes in the wooded areas, so that other players won't find anything and so that those items will be nearly certain to be found by the insurance bots. The final nod towards softening the game for players is that at certain purchase tiers for the game, players will get one of three different types of "safe containers." These are either the Alpha, Beta, or Gamma Containers and anything placed in these containers during a PMC raid, can't be lost during a failed raid. Granted these can't hold anything too big (most weapons won't fit inside the smaller two containers, the Alphas or Betas) but it works nicely for people trying to find a rare Key or Quest item but who might be worried that they won't survive to keep that item. And for those who might decry the idea that people can buy their way to a better experience via purchasing a higher tiered version of the game, players can still buy these containers as they get higher levels into the game and have more money to spend. And it stops there...but I thought it might help you a little. It's a work in progress. Sounds like it can be a lot of fun. I'm generally terrible at games like that these days, but I may give it a shot at some point. About a month ago I volunteered at work to show middle school girls around, as a woman in tech thing. The person running the volunteer day also wanted to do an activity creating board games as a quick way to show game design, so I also provided materials for that, since I design board games and have judged a few contests. Yesterday I found out that I can't participate anymore because I'm a contractor. It doesn't matter that we already didn't have enough women participating in the event. It didn't matter that they were talking of bringing in a past employee to help out - as clearly someone who was a full time employee even though they aren't here now is worth more than a willing volunteer who is merely a contractor. I'm livid. I was upfront with being a contractor when I signed on to volunteer, but the person running the program is new and I guess didn't understand I wasn't allowed until she told me via e-mail yesterday. I should have known, I was getting too complacent with my contractor status, since my team values me... but in terms of Amazon in general, I'm still less than a real person. So today I'm angry at that reminder. Some small part of me is amused though - we didn't have enough women to volunteer at an event to show young women are welcome in tech. Hah! Welcome! The cycle continues. I mean, I have a couple people that sub in for me at my store that I treat as contractors for tax purposes, but I treat them the same as our employee. Free coffee/drinks if they're working, that sort of thing. I guess it's not comparable, but there's a respect that I believe should be shown to anyone who's doing a job for you, whether they work as an employee or a contractor. Also I think it's pretty BS to hire someone for a job and call them a contractor when really they're just an employee you don't want to claim. The ones I treat as contractors are coverage people for when my wife and I both can't make it to the store, or when we have big events, which does not happen very often. But we'll be able to take vacations when we need them without closing the store. I've worked both as a contractor and with contractors. As far as I'm concerned -- outside of instances where there is company information that a contractor shouldn't be privy to and has no need for -- they should be treated the same as any employee. Certainly when it comes to volunteer work, of all things. Yeah... it's not like I'm going to be privy to secrets... these girls won't be signing NDAs, so none of us can talk about the projects we are on. Oh, and I was also supposed to be on a panel talking about what it is like to work in tech. I won't be able to do that either. It's just... so frustrating. Since yeah, I work over 40 hours a week at this job... and it's not like I'm here temporarily as my contract is pretty much for as long as I want it... it's just a benefits dodge for the company to call us contractors. @ Tony - that's awesome man, thanks for the writeup! I'm genuinely excited to jump into this game headfirst. Games like this that have a good risk / reward element to them are addicting to me - anything that makes it feel like you have something to win or lose each game. The stakes are always high. At first I know I'll want to "travel light" and only bring in the absolute basics into the fray. My goal is to build up that stash, and get to the point that I have enough tools at my disposal to stay in the fight. I love that you can do that in the game. Go in with nothing, but come out loaded up. That's cool, and it's something you really never see in a shooter. Really unique. The really funny thing is that most of the women on the team ARE contractors. One of the things that is under-discussed in American life (and this has struck me personally for at least 10-12 years) is how commonplace it is for there to be real and fake versions of all-but-identical jobs. And then you look at who has the real version, and are rarely surprised. And I have to doubt that they actually pay more to make up for what you don't get as a contractor. There's a nauseatingly big difference between what I make and what the people employed by the client company make even though we're doing the same job. Which, I suppose, is part of the point of bringing in a contractor instead of hiring another employee, but still. It's a big difference. You should be getting higher pay to compensate for the lack of benefits but I'm guessing that's not what you meant.